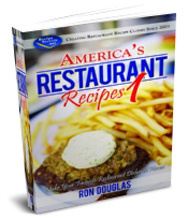 Get inside the hidden cookbooks of America's favorite restaurants! Prior to 1845, the Southwestern states of the United States were part of Mexico's territory. Even today, a delicious influence of Mexican cuisine influence remains in Southwestern dishes. Additionally you will also find recipes derived from native American cuisine, cowboys, and Spanish colonial settlers. Southwestern cuisine tends to make use of meat, beans, and be flavored with spices, especially chili peppers ("chiles"). Burrito - Burritos originated from Mexican cuisine, are a tortillas (unleavened bread made from maize or wheat flour) filled with meat, such as beef, chicken, or pork. Other ingredients such as beans, cheese, guacamole, rice, salsa, sour cream, or tomatoes may sometimes be added. Chile relleno - This dish also derives from Mexican cuisine. It is a chile pepper stuffed with cheese or meat, covered with batter and fried. Chili con carne - Chili con carne is spicy stew made from meat and chili peppers. Other ingredients such as beans, onions and tomatoes may be added in some recipes. Chimichanga - A deep-fried burrito stuffed with beans, cheese, rice, and meat. Fajita - Grilled meat (often beef skirt steak) served on a tortilla (unleavened bread made from maize or wheat flour), often with cooked onions and bell peppers, and sometimes cheese and tomato, are added. Condiments usually include guacamole, salsa, or sour cream. 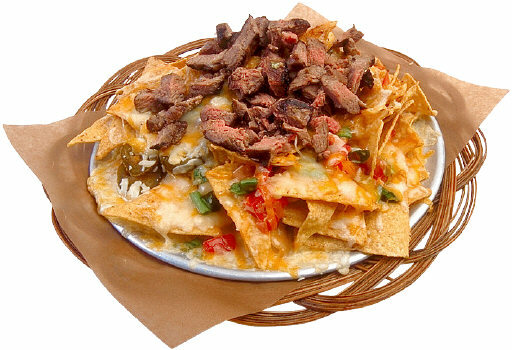 Nachos - This is a snackfood made by covering tortilla chips (crispy fried wedges made from corn tortillas), and covering them melted cheese or other toppings such as jalapeño peppers, onions, guacamole, salsa, beef or chili con carne. Rattlesnake fillet - Meat from a rattlesnake. It is said to taste somewhat like chicken, but be somewhat more chewy. Refried beans - Cooked, mashed black or pinto beans. The preparation involves soaking, stewing, mashing, and finally frying (usually with lard). Sopaipilla - A puffy crisp fried bread. It may be stuffed with beans, cheese, chile peppers and meat. Tacos - A crispy corn tortilla stuffed with various ingredients such as ground beef, cheese, lettuce, sour cream, and tomatoes. Taquitos - Small rolled-up tortillas with beef or chicken, and then fried.